New York City streets are a decadent mass of pedestrians, cabs, delivery trucks, and the crosstown bus, all scooting somewhere quickly. But even as rideshare apps are pushing more cars on the pavement, there’s one green and steadfast transit option that’s seeing a surprising surge in popularity. Right now, the city’s streets host 450,000 bike rides per day, an increase of 280,00 trips from 2005. To meet accelerating demand, the New York City Department of Transportation (DOT) promised on Monday to add 50 miles of painted bike lanes and ten miles of protected paths each year. 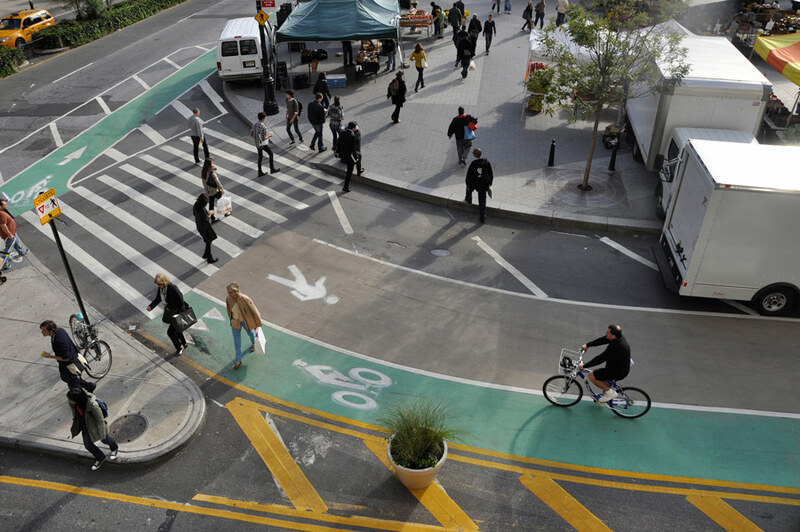 Over the last decade, New York has seen an explosion of bike infrastructure. Crain’s reports that cyclists now cruise over 1,133 miles of bike lanes, up from a little over 500 miles in 2006. Of those, around 40 percent are shielded from automobiles by concrete or other physical barriers. These are the gold-standard tracks because of the protection they provide relative to painted paths. But even this relatively robust network can’t stop bike fatalities. Nine in ten cyclists killed while riding are killed outside of bike lanes. In response, the DOT plans to ramp up safety efforts in three Queens and seven Brooklyn neighborhoods where many bike fatalities and injuries occur. Still, officials are optimistic that bikesharing, which was introduced only four years ago, will become further enmeshed in New York’s urban fabric. City Councilmember Ydanis Rodríguez, who represents Upper Manhattan and serves on the council’s transportation committee, would like to one day see free transfers between Citi Bike, the city’s bikeshare system, and the MTA. (An annual Citi Bike membership costs $163.) Citi Bike broke ridership records with more than 70,000 riders on one day in June of this year, while last year, the system logged more than 14 million rides. Despite their low cost relative to cars, and emissions-free crunchy-green aura that renders bicycles anodyne in most quarters, New Yorkers haven’t embraced bike culture universally. On the Upper East Side last year, residents objected to bike lanes near a school, worried that speeding cyclists could mow down young ones. Though those crosstown lanes were ultimately approved, out in Corona, Queens, longtime Community Board 4 member (and unrepentant xenophobe) Ann Pfoser Darby called bike lanes in her neighborhood a waste of money, claiming they would be empty after President Trump deported the area’s undocumented immigrants.